Women’s Basketball team head coach honored for the third straight season and for the fourth time over the past five seasons. Coach Alex Lang and his team during a timeout. 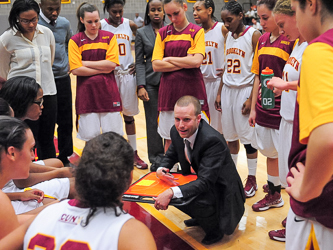 Alex Lang joined the Brooklyn College faculty in the spring of 2002 as assistant director of the athletics department and head coach of the women’s basketball team. His arrival coincided with the close of that team’s 2001-02 season—its worst ever, with a record of zero wins and 26 losses. In the years since Lang has put the kibosh on that no-win record. For the fourth time over the past five seasons, Lang has been named New York Athletic Conference (CUNYAC) Coach of the Year. He received the distinction first in the 2008-09 season and then in the 2010-11, 2011-12 and 2012-13 seasons. "I’m a very competitive guy," Lang explains. "I was competitive as a player when I was younger and I’m also that way now as a coach." Lang spent several years at City College as an assistant coach, but had never been a head coach nor coached in Division III basketball before coming to Brooklyn College. "When I got here, I knew that I had to turn things around, and do it quickly. I also knew that it wouldn’t be easy," he says. However, the young women on the team rallied under his direction and began to win games. "During my first season as coach here, we won four games, and the next year five games," he says. "We’ve kept on winning more and more games year by year." A growing collection of plaques are now displayed along a wall in his West Quad office. They prove how much things have turned around for the women’s basketball team, which now plays under the name of Bulldogs. The coach says he could never have achieved this string of successes without the talent of his players. Among the team members who have contributed to the Bulldogs’ success are Tiffany Thompson, Brittany Bowen, Nicole Francomano, Vanessa D’Ambrosi, Laurent Plagainoi, Justine O’Callahan, Ariel Smith, Frances Lyons and Priscilla Ramirez. At the end of the recently completed 2012-13 season, for instance, the Bulldogs racked up a total of 24 victories versus 7 losses. They went on to post another win in the CUNYAC championships before dropping the final to the top-seeded Baruch College Bearcats. The Bulldogs were top-seeded in the 2013 Eastern College Athletic Conference Division III Metro Women’s Basketball Championship series before falling to the second-seeded Hartwick College Hawks, 67-62, in the championship final. "We still haven’t won the conference yet," says Lang, determined to achieve that goal, maybe as soon as next year. A product of Bronx High School of Science, Lang attended Lehman College and then the State University at Albany, acquiring a bachelor’s degree in English in 1999. Since his arrival on the Brooklyn College campus, Lang has also served as director of sports information and, since 2007, as head coach of the women’s cross-country team. "We practice by running in the streets around the campus, on our newly built track and in Prospect Park on Fridays," Lang explains. The Bulldogs women’s basketball team will lose five graduating seniors this spring. Despite this, Lang says that he is confident the 2013-14 women’s basketball team will once again give a strong showing. Among the returning players for next year’s team, expected to be CUNYAC All-Stars, are Vanessa D’Ambrosi and Nicole Francomano.